Christmas is almost here and Amey staff who collect your waste and recycling deserve some time off too, so don’t forget to check when your rubbish will be picked up. 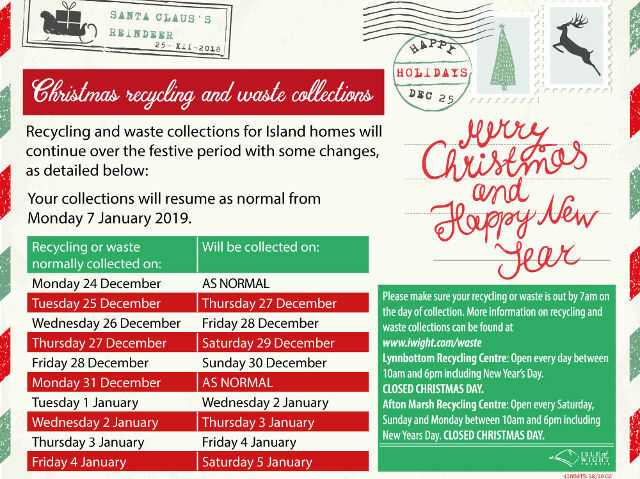 The festive season is almost here so don’t forget to check your recycling and waste collection days over Christmas (between Monday 25 December and Sunday 7 January). All recycling and waste collections will return to normal from Monday 7 January 2018. Please remember to set out your Wheeled Bins/Gull Sacks and food waste by 7am on the correct day of your collection or they will not be collected. Lynnbottom HWRC and Afton Marsh HWRC will be closed on Christmas Day but will remain open as normal throughout the rest of the festive period, including New Year’s Day. Lynnbottom HWRC is open seven days a week, while Afton Marsh opens Saturdays, Sundays and Mondays. Opening hours at both sites are between 10am and 6pm, apart from the Christmas Day closure. The council, in partnership with Amey, will collect excess polystyrene from households on general (black bin/sack) waste collection days from Monday 24 December 2018 until Friday 11 January 2019. If you have extra polystyrene packaging just place it within a clear or white plastic bag next to your black bin/black gull sack on your collection day. It must be in a clear or white sack so that the collection crews can easily identify it. The clear bag must only contain polystyrene or it won’t be collected. Any excess general waste or black sacks left to the side of your bin or gull sack will not be collected. After 11 January 2019, please remember polystyrene is not currently recyclable and must be placed in your black bin/black gull sack or taken to Lynnbottom or Afton Marsh Household Waste Recycling Centre and placed in the general rubbish skip. Paper based wrapping paper/ cards (without glitter) can be recycled in the paper/ card insert of your green recycling bin or the blue gull proof sack. Any extra can be placed in a clear or white bag to the side of the bin or gull-proof sack. Foil or glittery based wrapping paper and cards cannot be recycled and should be placed in your black bin or black gull proof sack. Cardboard can be recycled so can be placed in your paper/ card insert of your green recycling bin or the blue gull proof sack. If you have extra cardboard, simply bundle it together to the side of your recycling bin or blue gull-sack. These can be taken to Lynnbottom or Afton Marsh HWRC’s and can be donated for re-use. Clean foil and trays can be recycled. Excess recycling that won’t fit in your green bin or blue gull proof sack can be placed in clear or white sacks to the side of your containers on your recycling day. Non-recyclable excess side waste will NOT be collected and should be stored until your next black bin or black gull proof sack collection date, or can be taken to Lynnbottom or Afton Marsh HWRC’s.